Army of Russia bought in 2011 for equipment and units of missile troops and an army artillery modern self-propelled howitzers "MSTA-S", told journalists on Monday the Russian Defence Ministry spokesman Lieutenant-Colonel Sergei Vlasov. "In 2011, for equipment and units of missile troops and artillery of the Army provides to buy improved batch of 152-gauged self-propelled howitzers" MSTA-S "," - said Vlasov. He added that the modernization of the weapons has significantly enhanced its efficiency by implementing a management system that automates the processes of guidance and rehabilitation pickup guns. "The upgraded equipment has a howitzer battery survey and navigation, information exchange with the machine control of the composition of the automated fire control system that allows for much faster and more effectively carry out fire problem", - said Vlasov. He added that now a number of artillery compounds already rearmed for these howitzers and their entry into the forces will continue. Ultimately it will lead to a significant increase in capacity of military units of Land Forces to fire destruction of the enemy. Of course the MSTA is no slouch... a battery of 8 vehicles can fire 3 tons of projectiles at a target in one minute and of course move off immediately after that minute to avoid any return fire. So will Russia eventually switch to 155mm as a standard howitzer round for their ground forces? 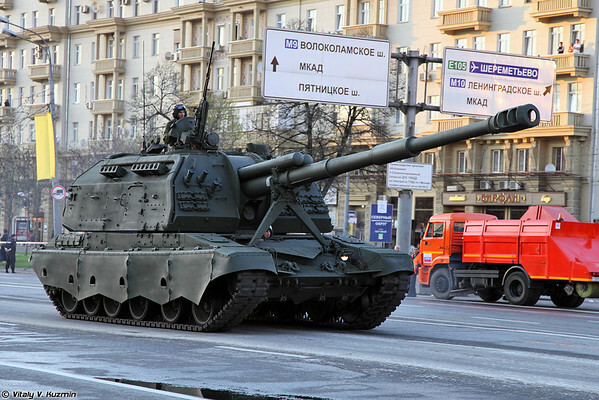 The 2S19M1-155 is aimed at export sales rather than for the Russian military. I rather suspect the Russians were working on new 152mm ammo for the Coalition which was a Msta with two 152mm guns that was a joint army and navy development. The program for the Army is most likely currently on hold because building up the C4IR system is a more efficient way of spending existing funding than developing a new 152mm round and guns to fire it. I would suspect the Navy program will continue and the result will be a stealthy 152mm twin gun turret with a significant range boost and most likely a range of guided projectiles to go with it. According to MOD sources a new variant of the MSTA SP gun with a longer barrel (52 caliber) will enter service in 2012. Max range will increase to 41km. However, the MOD has yet to order the new shells which will allow the new guns to perform at their best. It's believed there's a dispute over the price of the new shells and according to current plans, new artillery shells aren't planned to be ordered until 2015....there are still huge stores of older munitions which the MOD wants to get rid off before ordering new stocks. .there are still huge stores of older munitions which the MOD wants to get rid off before ordering new stocks. Good to hear they are taking this step... shame they are waiting so long with the ammo. For getting rid of 152mm ammo I'd suggest selling them to N.Sudan, N.Korea, Syria at discounted price. All of them will find it very useful and surely in need of those heavy caliber. Quite true... except for the stock that is unsafe... there seems to be quite a bit of that unfortunately. Of course the issue that everyone ignores is that there are two separate parties here... the new stuff will come factory fresh from the manufacturer, while the old stock belongs to the military. Of course the point is that with new electronic fuses you can make even the oldest shells much more capable by giving them air burst options. This will influence them too I guess. The new shells will have longer range and better overall performance and with these new fuses they will have the accuracy of a guided shell, which is a huge bonus. Older stocked shells will benefit from these new guidance kits as well, so as long as they are stored properly the older shells remain a useful resource. What I mean is that before these new guidance kits, the old stock only had the advantage that it was cheap... because it is already paid for. Compared with the new ammo it has shorter range and is likely less accurate, and I would assume newer ammo has been redesigned to make it more effective in terms of effect on target, so you would want to use up the old stuff during exercises and training so you can get the new ammo into service and use. With the new guidance kits... especially at only $1,000 US per unit, you suddenly have a new option of not using up the old stuff as quickly as possible, because with the new fuses it is now rather more potent. Stuff that is age expired needs to be disposed of, and ammo that is near expiry should be used up before it expires in training and tests and manouvers, but the other stuff can be kept and used in lieu of more expensive guided weapons. Of course if there is an export customer willing to pay for the older ammo then by all means make those sales as storage costs need to be allowed for in terms of deciding on solutions. The new ammo with extended range and improved performance with the new fuses/guidance kits will mean that instead of firing hundreds of shells at a target with only moderate chances of a hit, they can fire less than 10 shells with a good chance of hitting what they were aiming for. This will reduce by an order of magnitude the amount of ammo that needs to be stored. Of course it also needs to be kept in mind that a lot of older artillery pieces wont be compatible with the new longer range ammo, so while they remain in service and use the old ammo will still be needed. Perhaps sales of ammo could include some of the firing platforms as well. The 2S5 for example and of course the 2S3 both have 152mm guns but fire slightly different rounds from the MSTA to a similar range in the case of the 2S5 or the same shell to much shorter range in the case of the 2S3. The 2S5 lacks crew protection and 360 degree traverse capability, which could be acceptable if it offered an advantage in range or shell power. The 2S7 fires 110kg projectiles to almost 40km which might be useful, but with the new MSTA firing a very similar shell (about 44kgs) 10km further than the 2S5 can it makes little sense to retain or upgrade the 2S5. The question is what to do with the 2S5 and 2S3? Even without the new longer ranged ammo the new fuses could make both vehicles much more capable but a GLONASS electronics upgrade in each vehicle would be needed to realise its full potential with the new fuses. The MSTA will have the new electronics and communications systems to be able to take most advantage of the new Glonass fuses. The command vehicle that operates with the 2S7 could improve that systems performance with sat guided shells without costing too much and I suspect a similar option could be used for the 2S5 and 2S3 for export to the right customer... especially those that already use the chassis each vehicle is based upon. Just came accross this image. The gun looks different, particularly where it meets the turret. The muzzle looks different too. The gun seems also to be longer, but I am not sure. Is this the new version mentioned in the opening post? Below is a photo of a current version (for comparison purposes). Yes, I believe that top photo is the new gun... the recoil mechanism seems to be moved from above the barrel to below the barrel, and above the barrel is what appears to be a muzzle reference system... a small radar that transmits a very weak signal down the gun barrel. There is normally a reflector on the end of the barrel so the radar can detect even small deflections in the barrel. Often if the vehicle is sitting out in the sun the top half of the barrel is heated by direct sunlight while the underneath of the barrel remains cooler so the top half expands and the bottom half does not... this distorts the barrel shape, which the muzzle reference system can detect and alter the ballistic calculations to allow for in working out where the shells will land. After a few shots are fired the whole barrel is heated so the system continuously monitors the barrel for changes in droop or shape. If, driving through a forest, the barrel hits a tree and is bend slightly, the muzzle reference system will alert the crew and try to determine the effect on accuracy and trajectory. Even with guided shells you can't just point the gun in any direction and fire and expect the shell to get near the target... the gun still needs to be aimed, but with guided shells the extreme precision needed for unguided shells is not needed. It clearly has an extended length barrel, with a standard muzzle brake. This is perhaps a single barrel variant of the previously seen Coalition with dual feed auto loading and rather substantial muzzle brakes developed together with the Russian Navy. Of course the Coalition was based on the T-95 chassis rather than the T-80 as seen in these two photos... the Coalition turret is huge and also unmanned. The three man crew sat in the front hull position where the crew sit in the T-95. (The T-95 as an unmanned turret too, though not as big as the one on Coalition as it mounted two 152mm guns one on top of the other, with side mounted belt feeds on either side of both weapons leading to two autoloaders. 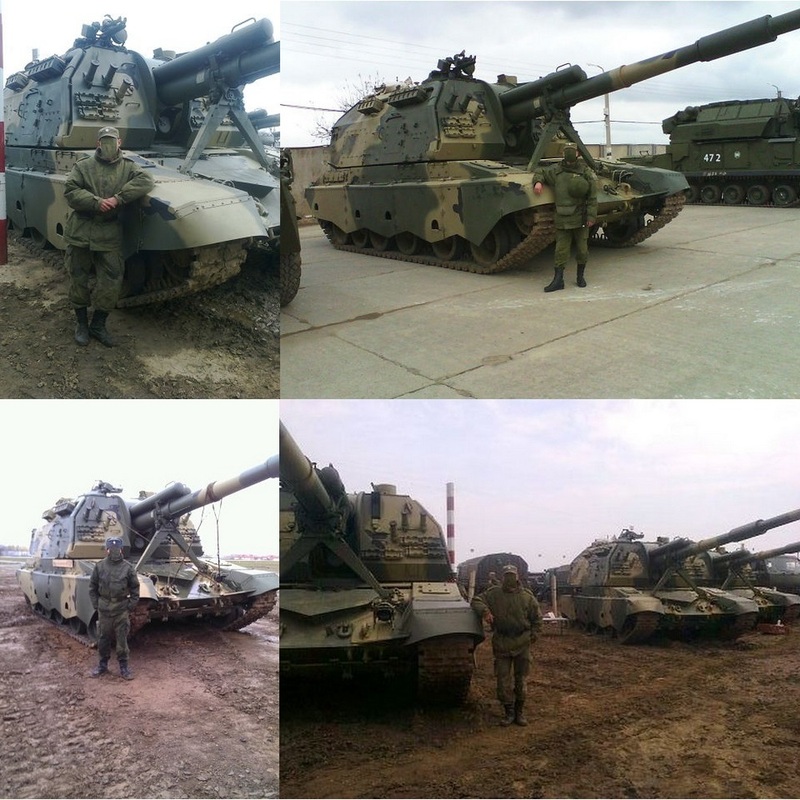 Both these photos clearly show manned turrets on T-80 chassis. 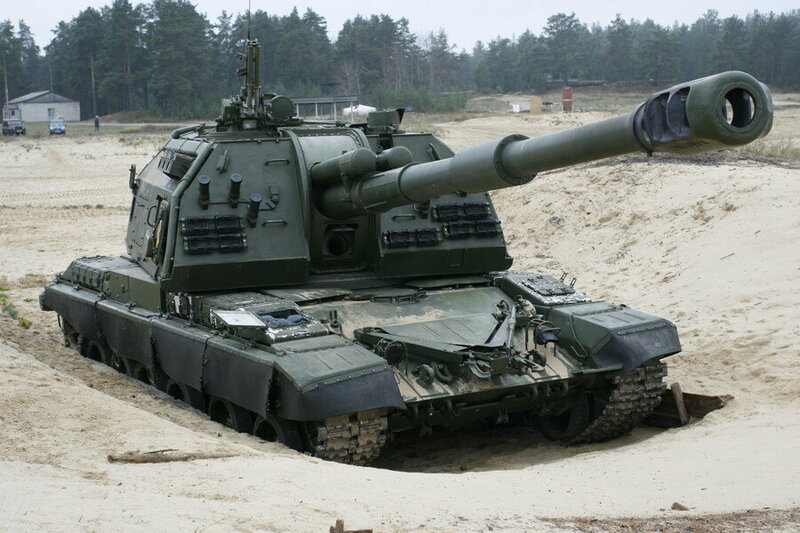 An advantage of a single (longer) gun in a manned turret is that upgraded T-72 chassis can be used till Armata is ready (it is also a tank with an unmanned turret). In Armata brigades Coalition would work well, while in brigades equipped with upgraded T-72s then a change from the T-80 base vehicle to a T-72 or T-90 chassis would make logistical sense. I seem to remember them saying it would extend the range of standard ammo to about 40km and that extended range new ammo would go further (as would extended range current ammo one presumes). With the new fuses/guidance packages accuracy will be excellent. Obviously $1,000 US sounds like a lot of money, but an RPG-7 rocket would probably cost about $700-800 US dollars or more, so a 152mm artillery shell would likely cost a couple of thousand dollars with a normal mechanical fuse costing several hundred dollars... especially with multiple safeties and a proximity fuse, so $1,000 US for an electronic fuse with GLONASS guidance is actually very cheap... especially when it reduces the number of shells needed per target will dramatically be reduced. In many ways it is similar to Ugroza in that although more expensive per round, you save a lot of money because not only are you needing a small fraction of the shots needed to deal with targets, you can also engage targets from extended ranges and still be confident of a kill, and you spend less time firing at targets, both of which make the firing platform much safer and more efficient on the battlefield. Against area targets cheaper unguided munitions can still be used where appropriate. April 16 at the railway station in the Chechen Republic Khankala finished loading on the platform 20 self-propelled artillery systems (ACS) 2S3 "Acacia", which will be framed on the basis of storage in the Sverdlovsk region. 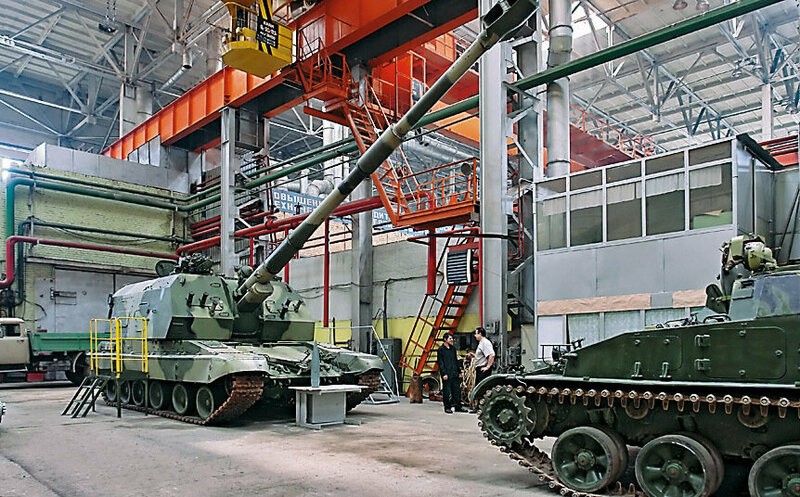 They were replaced as part of the rearmament program of the Southern Military District on the new models of weapons and military equipment in the past year has received advanced 152-mm self-propelled guns, "MSTA-S". The new ACS is fully equipped with artillery units Motorized Infantry Brigade, stationed in the territory of the Chechen Republic. As a result of upgrading the efficiency of this type of weaponry greatly enhanced by the introduction of management systems, providing automation of pointing guns. The upgraded equipment has a howitzer battery survey and navigation, automated fire control. The use of ACS 'MSTA-S "can significantly increase the firepower to defeat enemy forces. It has to be the 2S19M1-155. This is basically a NATO standard variant and have a 155mm, 52.cal gun. This system was also offered to India for joint development around early 2000 and for local production there-on. The system in its definite form was displayed in Solvakian defence expo during 2004 - 2006. I'll check the correct expo and year and confirm later. It was featured in one of their expo publications. The same SPH was present in the Russian arms expo. It seem that the serial production of highly modernized 2S19M2 (former Dilemma-2 project) with ,among the others, extented barrel length, increased precision and range of fire from 29 to 42 km and rate of fire to 10 rounds/minute , finally begun. Naturally the greater merit of this program will be not only to provide an efficient "bridge" system up to the introduction of the new generation "Koalition" ,but also a good basis for test and training with the new ammunitions (including the critical GLONASS guided ones). Victor- still trying to nail the number, but the contract was for 130 @ UMZ for 2012. The 152mm 2S19 MSTA-S self-propelled howitzer was displayed at the Russia Arms Expo (RAE) 2013 in Nizhny Tagil on Thursday. The artillery piece is designed to defeat unsheltered and entrenched manpower, weapons and material. The base of the MSTA-S is composed of the hull of a T-80 tank with a T-72 tank engine. The tank can reach a firing rate up to 8 rounds per minute because the gun-loading, targeting and re-targeting is mostly automated. The MSTA-S is manufactured in the Uraltransmash factory in Ekaterinburg. are there any new versions (2s19М2) delivered to the Russian army?? George1 wrote: are there any new versions (2s19М2) delivered to the Russian army?? "Victor- still trying to nail the number, but the contract was for 130 @ UMZ for 2012." Oops, should be clear that number was regarding T-72B3. I have no clue about 2S19M2 numbers, but it has been spotted in mass service. TR1 wrote: I have no clue about 2S19M2 numbers, but it has been spotted in mass service. AFAIK 40 pieces have been delivered to SMD.